At Mr. Meticulous, we believe that serving our customers goes beyond just cleaning. We know how important appearance is to the success of a business. A clean office and building help project a sense of order and success. We know that your time is valuable, and we strive to make the cleaning of your building one less thing for you to worry about. As such we can compliment our cleaning services by making recommendations on more cost effective ways of dispensing paper and soap supplies. 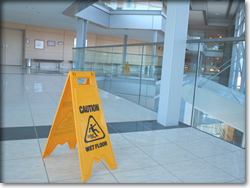 We also provide safe, environment friendly cleaning products to target all of the needs specific to your building. Know if the cleaner clocked in/out from your facility. Know if the cleaner arrived late and/or left early. Know if the cleaner is a no show. Frees up Area managers to concentrate on training and quality control. Leave voice messages for the employee. In addition to our Off-Site Supervisory Timekeeping System, we also have Four (4) Area Account Managers who bring a daily one on one personal touch to the services provided. We endeavor to keep their skills sharp and up to date by having them in attendance at industry related seminars. With regular quality control inspections, phone calls, and emails; they keep their finger on the pulse of your facility and on the employees cleaning your facility.